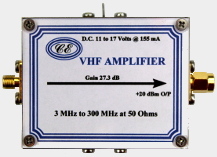 The price of the VHF Amplifier in an Original Size FLEXI-BOX is dependant on the connectors required. To find the price for your connector preference or to make a purchase, select your connector requirements in the boxes beside the photograph below and then hit "Add to Cart". This amplifier is the first of a series built in the Original Size FLEXI-BOX and has both supply regulation and output circuit protection. The three stage amplifier gives an output of greater than +20 dBm (100mW) at 1dB compression right across the band of 3 MHz to 300 MHz. The amplifier does perform well down to about 50 KHz but is not tested in production to less than 300 KHz. The dc supply can be from +11.0 Volts to +17.0 Volts @ 155 mA and so the amplifier can be powered from a radio hams +13.8 Volt system. The RF connectors can be selected from BNC, N, SMA and TNC. Other connector types could be fitted if required in quantity and we are always interested to know what other types are wanted. So, if you would like another type please contact us and let us know. The amplifier is referred to as being an VHF amplifier but it can be seen in Figures 1 and 2 that the frequency response goes lower than the VHF band and it could also be used for HF. The isolation S12, has been omitted because it is better than -55 dB from 3 MHz to 300 MHz and would cramp the scale of the other measurements. The above results were obtained with SMA connectors and the performance will most probably be inferior with any other type fitted.